Michael McFadyen's Scuba Diving - Tupi's Passage The eastern side of Rarotonga in the Cook Islands has a number of dive sites. From the boat ramp at Avatui Harbour you pass the town of Avarua and it is about eight minutes run in the fast RIBs used by most of the dive shops. This dive site is located on the north-eastern corner of the island. This dive site is located a few hundred metres off the shore, straight off a small creek and a hundred metres south of Arbuthnotts dive site. This section of the island does not really have a fringing reef like most of the rest of the 32 kilometres of the island's coast. The shallow reef drops deeper. There is not really a passage here, so I do not know why it has the word "passage" in it, although I was told that the cyclones in early 2005 pushed a lot of coral up onto the beach. The anchoring spot is about 150 metres off the shore. This site consists of a series of ridges and gullies running west-north-west. The depth at the anchoring spot is about 10 metres. The bottom is a flatish sandy bottom at about 12 metres with some isolated bommies. The sand gradually slopes to 20 metres. This is the reef edge and it drops away to 30 or so metres before sloping more steeply to a greater depth. We headed to the south following the broken reef edge. This had some small overhangs, gullies and isolated bommies. Like all the other spots I dived in Rarotonga, the coral here is not very good. I estimated that there was only about 10% live coral. I also saw no sponges at all and not even a tiny gorgonia (let alone a huge one like seen in many South Pacific Ocean countries). There were a few giant clams at this site, although not too huge. Fishlife was also sparce. We saw a white tipped reef shark which kept close to some bommies. 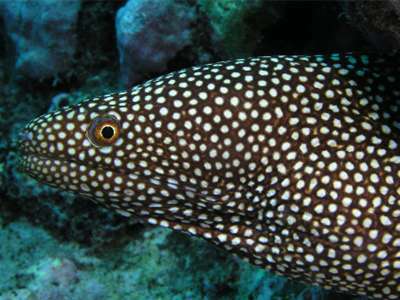 At one spot we saw a couple of very small Guineafowl moray eels. There were a few surgeonfish and trevally, some different butterflyfish (threadfin, longnose) and a few Moorish idols as well as some triggerfish. That is about it except for heaps of black sea cucumbers, they are everywhere in Rarotonga. The one good thing about this dive was the visibility, in excess of 40 metres. Water temperature in June was 24.5° and air temperature 23-25°.